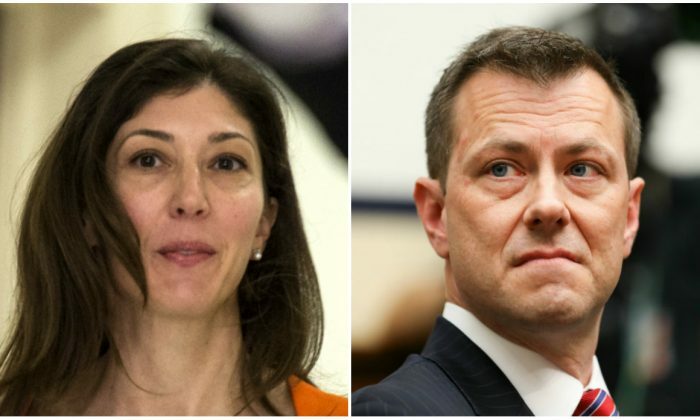 President Donald Trump criticized former FBI Deputy Assistant Director Peter Strzok and his mistress, former FBI attorney Lisa Page, on Sept. 13 as an “embarrassment” to the FBI and DOJ, after newly leaked text messages between the two showed that government officials were “leaking like mad” to damage the president. After Rep. Mark Meadows (R-N.C.) revealed in a letter that Strzok and Page had discussed a “media-leak strategy,” a new batch of communications between Strzok and Page was selectively leaked to Fox News and investigative reporter Sara Carter. A spokesman for Meadows didn’t respond to a request from The Epoch Times for the full text of the communications or the context of the exchange between Strzok and Page. “More text messages between former FBI employees Peter Strzok and Lisa Page are a disaster and embarrassment to the FBI & DOJ. This should never have happened but we are learning more and more by the hour. ‘Others were leaking like mad’ in order to get the President!” Trump wrote on Twitter. One exchange, dated Dec. 15, 2016, shows that Strzok and Page were intimately familiar with an upcoming New York Times article. “Oh, remind me to tell you tomorrow about the times doing a story about the rnc [sic] hacks,” Page wrote to Strzok. “And more than they already did? I told you Quinn told me they pulling out all the stops on some story.” Strzok replied. The “rnc” acronym refers to Republican National Committee, the “times” refers to The New York Times, and “Quinn” is likely Richard Quinn, who headed the FBI’s Media and Investigative Publicity Section in the Office of Public Affairs until last November. “Think our sisters have begun leaking like mad. Scorned and worried, and political, they’re kicking into overdrive,” Strzok wrote in a follow-up message. By “sisters,” Strzok likely referred to any of the other intelligence agencies in the Intelligence Community. On the day the texts were sent, news outlets cited “American intelligence officials” in reporting that Russian President Vladimir Putin was personally involved in a cyber attack on the U.S. election and gave the go-ahead to carry out the operation. Less than a week prior to the texts, The New York Times cited “senior administration officials” to report that U.S. intelligence agencies had concluded that Russia interfered in the election to harm Democratic candidate Hillary Clinton and promote Trump. The Department of Justice (DOJ) received new Strzok-Page messages from the DOJ inspector general and forwarded the batch to Congress in mid-August, according to a DOJ spokesperson. The FBI fired Strzok in August. Page left the bureau in May. Strzok was the lead agent in two of the biggest investigations in the United States in the run-up to the 2016 election: the probe of Clinton’s use of an unauthorized private email server to conduct government business and the counterintelligence probe into allegations of collusion between Russia and the Trump campaign. Strzok and Page worked on special counsel Robert Mueller’s team once it took over the Russia investigation. Mueller removed Strzok from the investigation after seeing texts where Strzok expressed intense bias against Trump and in favor of Clinton.